Jenkins is a new software tool in open source continuous integrated environment. Jenkins is written in Java programming language and it is used for testing and reporting on confined changes in a larger code base in real time environment. This platform provides developers to find defects in a code base and then solve the issues in it. This software also provides automated testing environment. It provides continuous integration services for software development. This works in server based environment by running in a servlet container likewise Apache Tomcat. Jenkins supports SCM and RTC tools. It has also the ability to execute Apache Ant and Apache Maven projects in addition to Windows batch commands and shell scripts. Jenkins is first time released under MIT license which is now free tool. The major two operations of Jenkins are continuously software building or testing and monitoring executions of externally run jobs. 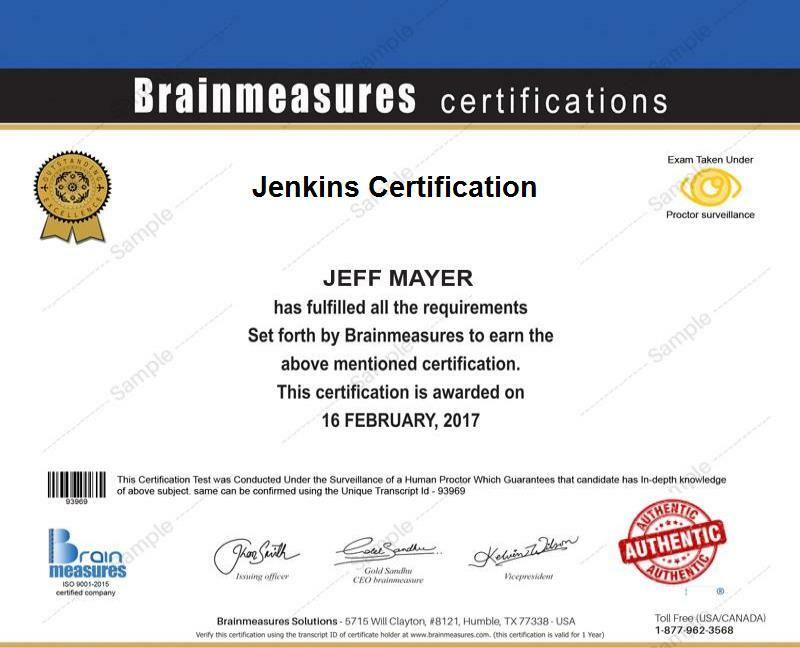 Jenkins certification program from Brainmeasures is a unique program that'll enable you to become much more proficient along with skilful in software testing, software building and continuously monitoring the execution of externally running jobs. This qualification program will definitely increase your experience and efficiency in using the Jenkins. After going through the distinct topics involving Jenkins qualifications of Brainmeasures, it is possible to face different approaches continuous testing and monitoring applications. This just all definitely requires to join Branimeasures Jenkins course and that is enriched having practical scenarios and different code writing approaches in the program. This is not just an additional expertise within your Resume but also causes to increase your salary and chances to have promotion within your career route. Entitlement regarding Jenkins expert, analyser, engineer, developer, tester as well as implementer etc. through this certification program of Brainmeasures not just develops expertise but also increase your income and wealth generation sources. The average annual salary in case you hold Jenkins certification with other professional degrees is $92,000 per year and this can be grown to $100,000- $145,000 based on level of apropos expertise, experience along with reputation of the employee and organization in the relevant area. Jenkins is an emerging tool in testing and code development. So it is a demanding tool in computer science field. This certification of Brainmeasures requires some technical knowledge, expertise in object oriented and testing environment both in automated and manual based. However, enrolment is not just confined to experts. All learners, programmers, applications developers and testers can join who are eager to enhance their competencies in the smart testing, programming and increase their expertise in computer science. This certification program appeals to everyone whether a technical and IT specialist, software programmer, software developer, software engineer, software auditor, QA and QC engineers as well as students, individuals and corporate players who wish to understand about Jenkins and its applications.